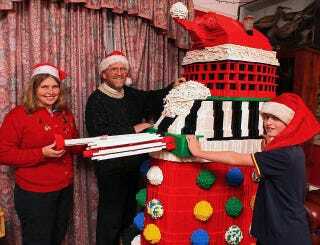 This is the Addis family and their 100,000-brick Lego Christmas-themed Dalek—Dr. Who's enemy cyborgs. Every December, the Addis—Mike, Catherine and their three children, Tom, Holly and Christopher—spend hours creating something massive out of bricks. The Dalek took them 200 hours. For 18 years they have been building pretty crazy stuff, from a human-sized Nutcracker to a gigantic model of Earls Barton Sexon Church. Big enough for the children to get in. Back when Tom was a baby, a family friend brought a Lego set, and that's how it all started.